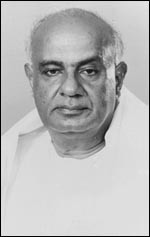 A Civil Engineering Diploma holder, Shri Deve Gowda plunged into active politics at the early age of 20 when, after completing his education, he joined the Congress Party in 1953 and remained a member till 1962. Coming from a middle class agrarian background and exposed to the hardships of farmer's life, young Gowda vowed to become a fighter who would take up the cause of poor farmers, under privileged and oppressed sections of society. Before his political initiation, Shri Gowda had been a contractor taking up minor works. The seven years that he spent as an Independent helped him observe party politics from outside. Ever a workaholic, he was always seen engrossed with books and periodicals in the legislature library. His re-election in 1967 gave him more confidence and in 1969 when the Congress split, he joined the Congress (O) headed by Shri Nijalingappa, which was in power in Karnataka then. But Shri Gowda's big chance came after the rout of Congress (O) in the 1971 Lok Sabha elections. He emerged the leader of a truncated opposition hit by the Indira Gandhi wave. The leadership of the Third Front (a group of regional parties and Non-Congress and Non-BJP combine) leading to Prime Ministership - came to Shri Gowda without him seriously aspiring for it.